Overshadowed by Sibelius, Nielsen (Danish) can come into the light and take his place as a great 20th century symphonist. Although his music represents extremes, both of emotional content and musical style, it is - now - always effective. Controversy followed Nielsen who was constantly pushing boundaries and challenging the norm. Then, some found his music hard to swallow, but their objections will not be heard today. These symphonies are surprising, refreshing, moving and compelling, played here by a world-class orchestra. 'Isis' is a symphonic poem for female choir and orchestra. The symphony is also scored to include a female choir and tenor. The Newent Music Appreciation Group (NOMAG) commented: "Creates colours in the mind,"; "Reminds me of Debussy,"; "Has scenes of cold, empty spaces,"; "I felt I was in a forest,"; "Filmatic - easy to conjure images while listening." A remarkable violin virtuoso who taught Yehudi Menuhin, Rumanian, Enescu's (1881-1955) success suffered from being caught between the communist east and the prejudice of the west, between classical and avant garde sounds. His work should be be heard more and this recording will certainly help. 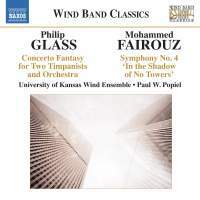 A listener coming to these trios without knowing Beethoven, would be greeted by two lyrical, inventive, playful pieces, seemingly devoid of Sturm und Drang. Superbly executed by this minimal grouping of instrumentalists who create a sense of their ease and clarity with this music. Sit back and enjoy. The Glass work is Glass being playful with his music and the tymps. It's a great "listen", leaving you feeling good about the world. The Fairouz is deeper and contrasting. Inspired by terrorist war cartoonist, Art Spiegelman, he (Spiegelman) describes it as a "very tony piece of high-brow cartoon music." I hear what he means. Check it out. It shouldn't be said but a female conductor is a relative rarity. 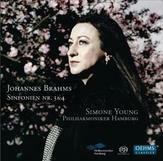 Here, Simone Young recreates two Brahms symphonies that are unforgettable. Never forceful, her style is understatement; the result is quite remarkable in its intensity. If the aim of a symphony is to take the listener on a musical journey, then this (Op.63 in E flat major) must be one of the greatest such journeys that you will undertake. 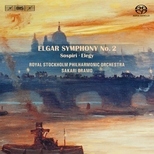 Elgar's effortless orchestration brings an ever-changing, endlessly stirring, inspiring and self-reflective sound-scenery, as this famous Swedish orchestra and its conductor do the work full justice. 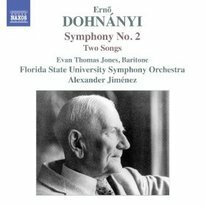 Bonus tracks, also by Elgar: Sospiri for strings, harp and orchestra, Op.70, an intense work (sospiri is Italian for "sighs"); in conclusion, the Elegy for strings, Op.58. Revised in the 1950s after composition during the WWII, this long symphony - nearly 60 mins - is worth every second for its great lyrical depth. An occasional uneasy atmosphere is the only suggestion of the events out of which this was born. The composer was perhaps the last in the tradition of romantic symphonists. Best known today for his 'Hebraic Rhapsody' for cello and orchestra, Bloch (1880-1959) fell unfortunately into the chasm between traditional lovers of classical music and the modernists. His music is unique, offering some clearly 'modernist' chordal surprises, but companioned by lyricism and clear expression of feeling. Hear this and I suspect it will become a symphonic favourite. This is a 'find'. The symphony is a luxurious piece of contemporary music, mainly gently atmospheric, punctuated with expressive percussion. 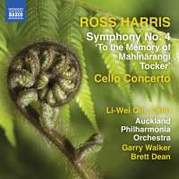 It is New Zealander Ross Harris's tribute to poet/songwriter Mahinarang Tocker and features a solo viola voice. Instantly enjoyable and with a depth that suggests many plays to come. The cello concerto is more than a bonus on this recording.